Lubricating and maintaining such lubrication is critical to the life of the bearing. A bearing is designed to carry tremendous loads while also being soft enough to allow small particles to “embed” in the bearing material. The various designs of bearings all address these primary needs. In addition, a bearing is a sacrificial part, in that it is easier and less expensive to replace bearings due to wear, than to replace the crankshaft. Coatings come in two basic formulations; Solid Film and Dry Film. While the two terms can be and are to a great extent interchangeable, when it comes to bearings, the differences are important. A Solid Film lubricant derives it’s name from the resin film formed during curing. This film has greater internal bond strength than the bond to the substrate, in this case the bearing. A Dry Film, on the other hand, has a weaker internal bond than the bond to the substrate. When these features are applied to a bearing, the Dry Film is superior. Since no coating is a 100% friction-free material, some pressure will be exerted against the coatings. In a rotational application, such as we are discussing, the coating needs to be able to MINIMALLY flake away when such pressure is reached. Otherwise, the coating can delaminate. Generally the particle size that can be removed is under 1 micron. The coating is capable of withstanding pressures in excess of 350,000 psi while lubricating. This is well beyond the strength of the bearing itself. As pressure increases the coating actually becomes more lubricious. In addition, it is a “fluid retaining” material that actually holds oil in place on the bearing. One of the most important features is it’s ability to maintain it’s full lubrication characteristics even in extremely thin films. Typically will be applied in a film thickness of from .0003″ to .001″. Obviously this would affect clearances when the film approaches .001″. After checking the thickness, burnish with “Scotchbright” or similar material until the film thickness is no more than .0003″. During running, the coating will burnish to a near “0″ dimension. 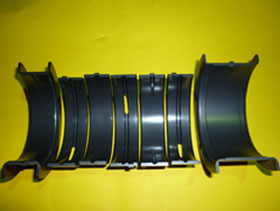 This characteristic allows the bearing to be run with its normal installed clearance.